Loss something and gain something so much better. Well thats what happened when Ha Long Bay opened after the owners left China Palace in my hometown. Which I had mentioned in a couple post back about Beaver Dam grub. With a six page menu it has become apparent that it's going to be hard to taste the whole menu, when most of everything I want to order again sooner then later. Every time I've got to order either the papaya salad or AP10(spring roll with a fried egg roll inside. What!). 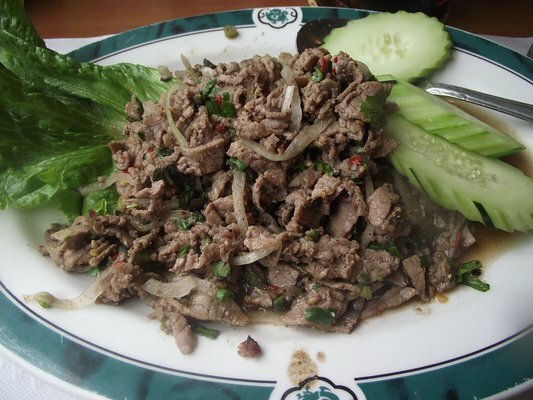 If you like food with strong aromatic components like fish sauce and a spicy edge then Thai food is there for you. With most dishes hitting up to four or five fundamental taste senses in each dish too: sour, sweet, salty, bitter and spicy. My nose and mouth is just watering thinking about it. Plus they've got that amazing sesame chicken on the menu. I've known of Inka Heritage for sometime now. Never had a reason to rush their until a coworker told me that they went there and were quite surprised. I've never been to a Peruvian restaurant before, so I wasn't sure what to order. But when I see raw meat and fried egg anywhere on the menu my eyes are drawn to those items. I've only ever had ceviche before at Frontera Grill. Now it's hard to do better then Rick Bayless, but Inka did good. Not dangerously spicy, mostly all seafood rather then having a equal amount of fillers to deceive your eyes. There was Peruvian Corn (choclo or cuzco corn) in it also. Nutty flavor rather then sweet like your typical American corn and added crunch to the dish. Next I ordered Lomo Inka Heritage aka Meat and Potatoes in a way. When I ordered the dish I asked for the meat to be rare cause that how I like my meat. She had an odd confused look on her face and then ended up coming back to the table asking if I meant medium rare. I just said "sure, yeah" thinking that they where afraid to cook meat that way and just hoping that I wasn't about to receive a dog toy of a meat. But I was happily surprised when I received the dished that the beef was not rubber. Was unevenly cooked thou with parts being rare and others being medium rare. After rereading the menu online I saw that the dish was also to have a creole sauce that wasn't present but wasn't needed with the liquid gold of a yoke from the egg. The taco taco pancake wasn't sweet, you get that from the plantain, but was well seasoned with garlic and onion. Now you can't skip dessert when it's made in-house. So, very surprisingly I have never have had Tres Leche before. Which you would think cause I love bread pudding which is what this reminded me of. Not too sweet, obviously moist. Got a corner piece which I think is the always the best specially with brownies. Ceviche - raw fish marinated in lime juice, yellow chili pepper, garlic, ginger and other herbs with sweet potato, onion, and Peruvian corn. Lomo Inka Heritage - beef tenderloin with "taco tacu", rice and canary bean pancake grilled, served with fried egg, sweet plantain and creole sauce. Tres Leches Cake - sponge cake covered with three milks, touch of pisco and topped with chantilly cream.